What materials should your TES Tank be built in? Thermal Energy Storage (TES) system comprises of storage medium, a tank, a packaged chiller/built-up refrigeration system, and interconnecting piping, pumps, and controls. The basic concept of any TES system is that chillers cool water during off-peak hours and then the cooled water is stored in tanks. When temperatures rise, the stored water is used for cooling. Controls and pumps come into full action during this stage. Each of the listed components plays a critical role in the energy storage and dissipation process. 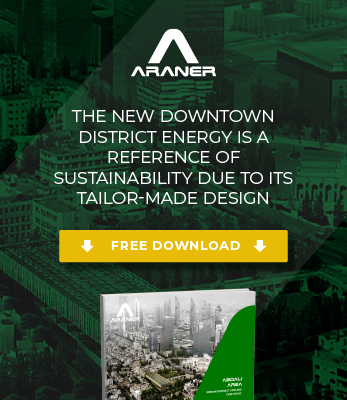 A TES tank from ARANER reduces capital cost, required capacity and operational costs in a cooling plant because it is a naturally stratified thermal accumulator. The company is renowned for providing tailor-made solutions for refrigeration, cooling and heating applications. The following review of steel and concrete tanks is important because ARANER projects feature these components. Steel tanks are popular in TES projects across the world. ARANER can help you install this type of tank with unbelievable reliability. Why would you choose to use a steel tank for TES? A steel tank has the unmatched benefit of low initial cost. ARANER team makes reliable storage tanks using the most advanced welding methods. These reservoirs abide to various international construction standards and have been proven leak-free. Another impressive characteristic of these tanks is their applicability in a wide range of projects. With the cylindrical pressurized versions having a capacity range of 3,000 to 56,000 gallons, it is clear that these products suit the storage needs of many TES clients. What we must note is that most steel tanks are still largely restricted to aboveground because of humidity issues. Going for steel TES tank means readiness for higher maintenance costs. When it comes to this maintenance, the API 653 comes into focus. This is a set of guidelines for anything to do with inspection, repair, alteration, and reconstruction of aboveground steel tanks in America and other entities. You can visit the American Petroleum Institute (API) for more details about these guidelines. Despite these drawbacks, cylindrical steel tanks are common sights in the industry. Steel may be prone to corrosion, but new technology is making these tanks very usable. A popular method of dealing with corrosion is the use of polyurethane coatings for both interior and exterior of the tank. Maintenance costs could be the reason most providers still prefer to use these containers for aboveground applications. If you were looking for a small system, you would probably go for a pre-fabricated steel tank and enjoy a low initial cost. Otherwise, you may want to switch to a reinforced concrete reservoir to serve a larger system. Concrete TES tanks are the most popular for underground storage, and provide flexibility to adapt their shape to the requirements of the plot. The tanks can be either cast in-situ or precast/pre-stressed. Which of the two is better? If you were to consider a practical scenario, choosing precast concrete tank means less occupied area and lower installation time. However, it is not always the optimal choice. Latest post-tensioned techniques provides as well reduced area occupation and cast in-situ tanks should be the concrete tanks of choice for any projects where integration with existing buildings is preferable or where singular shapes or heights are required. The primary concern for any maintenance team handling a concrete TES tank would be the likelihood of leakage. Cast-in-place reinforced concrete tanks are known to be susceptible to leaks. A good provider should be able to provide periodic checks to ensure the tank is working as expected. Concrete tanks have been known to be more durable than steel tanks. However, changes in design have made the conversation more interesting. The use of reinforcing steel in concrete could bring corrosion issues, thus affecting durability. If this likelihood is contained, concrete tanks still come out tops. Are you ready for TES tank installation? Energy storage is crucial in any major facility because it increases reliability and smoothes supply. For a power generating plant, the importance of load leveling cannot be overemphasized. How do you get to choose the ideal TES tank material? There is no shortcut to this; a feasibility study must be done. As this involves an intricate procedure that puts a host of factors into considerations including facility load profile and available space, it is important to contact a competent provider. Get in touch with ARANER for more information about design and installation of various types of TES tanks.